Your lifestyle helps determine the type of vehicle you need. This can range from a small car great on fuel economy for students to a luxurious SUV for the modern family. When purchasing a vehicle, you need to keep your needs in mind, including if you need to haul materials as part of your job, need a fast and sporty model to make an impression, or need a roomy van to get you and your kids to where they need to go on a daily basis. Make sure to choose the right vehicle for your needs when buying a car by keeping certain factors in mind when vehicle shopping. One of the biggest factors in determining which vehicle you buy is cost. This is especially true for drivers who are just starting out. And unless someone is buying the car for you, how much you can afford plays a huge part in the vehicle you end up buying. Luckily, you have many options available to you as a car buyer, including the following high-quality used vehicles, even when purchasing on a budget. 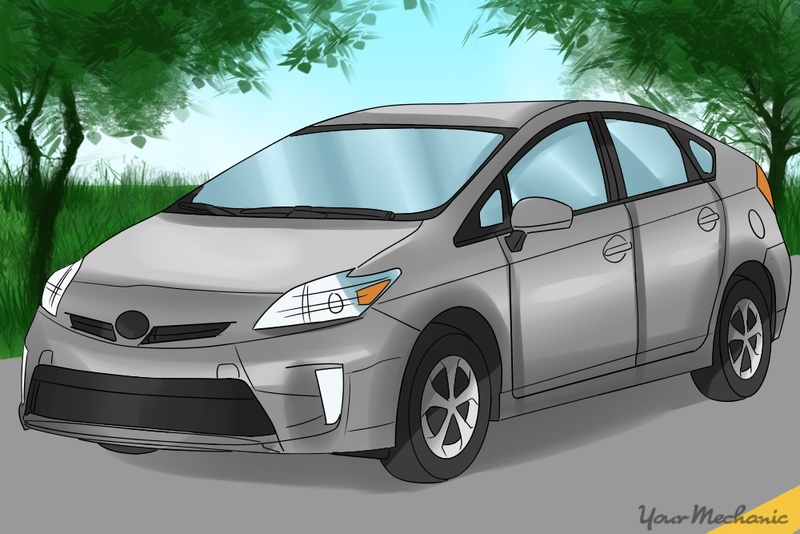 Toyota Prius: The Toyota Prius offers a hybrid vehicle at an affordable price if buying used. The environmental benefits of the Toyota Prius make this vehicle ideal for those looking to reduce their environmental footprint. Its various cruising modes allow you to save on gas, and when the battery charge gets low, the gasoline engine powers the electric generator, which recharges the battery, all without the hassle of having to plug in. 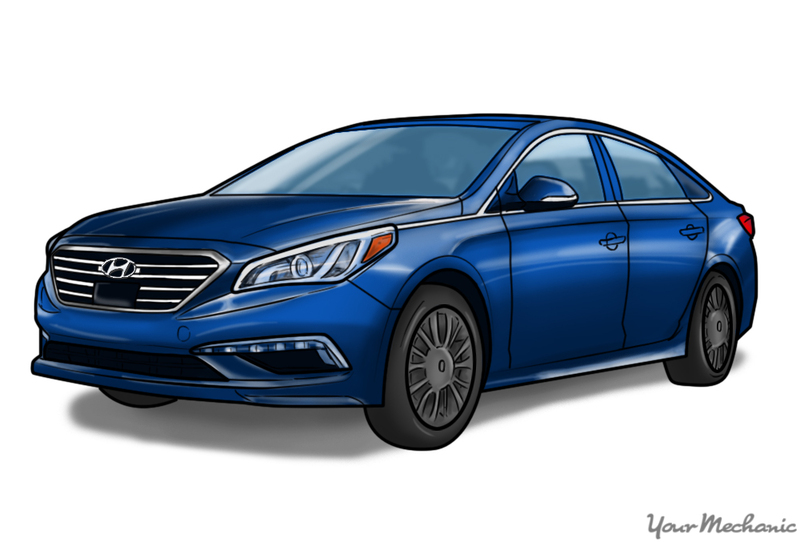 Hyundai Sonata: The Hyundai Sonata, while not as flashy as other cars, gives drivers added fuel economy, as well as an overall lower sale price, making it appealing if you are on a budget. The Sonata's large body design keeps drivers safer with a "Good" side impact Insurance Institute for Highway Safety (IIHS) crash safety test rating. 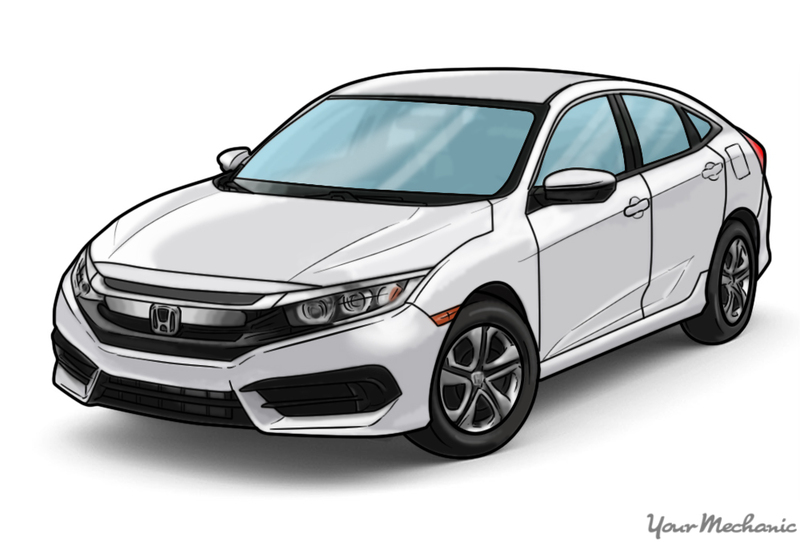 Honda Civic: The Honda Civic makes a great beginner car for someone just starting out as a driver. One of its best upsides includes its durability. 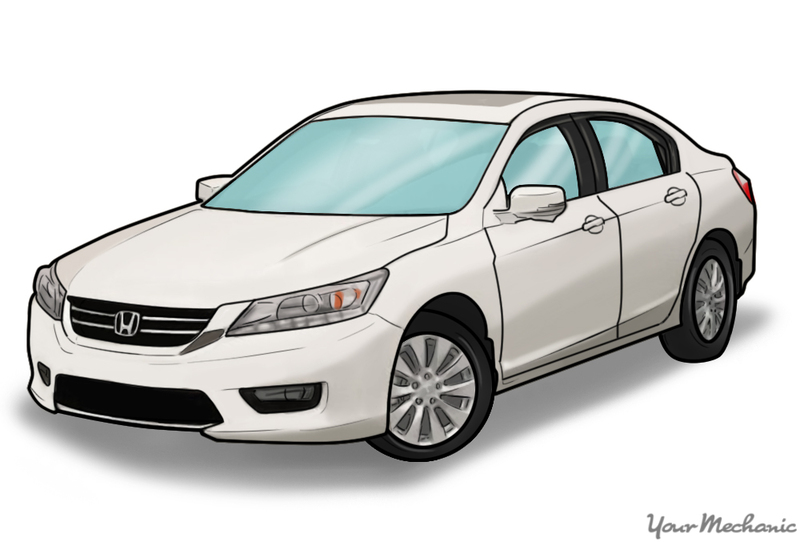 If properly maintained, a Honda Civic can last vehicle owners well over 200,000 miles. Plus, the Honda does not cost a lot to repair, has great aftermarket support, and offers a sale price that many young buyers can afford. Another factor that many consider a major deciding factor when purchasing a vehicle is safety. Safety ratings are based on IIHS or the National Highway Traffic Safety Administration (NHTSA) crash test data, and they can inform you if a vehicle is safe when subjected to frontal and side collisions, as well as rollovers. 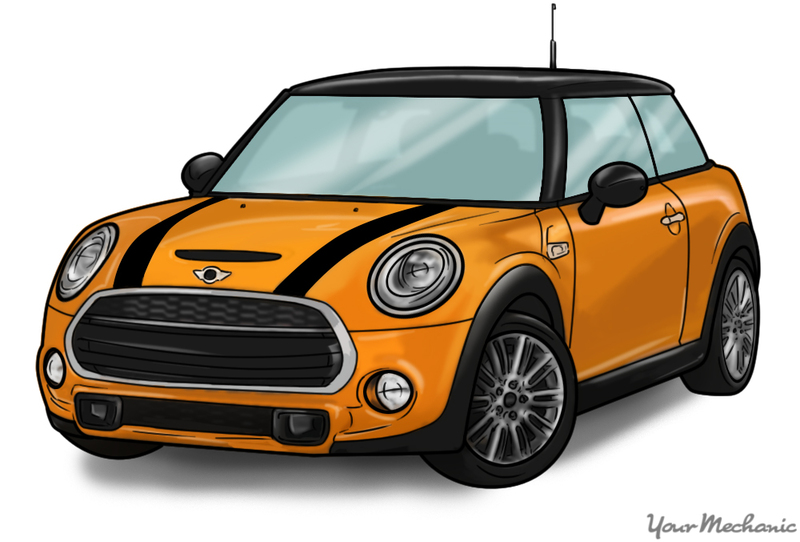 Mini Cooper: According to the IIHS, the Mini Cooper has an overall "Good" rating when it comes to crashworthiness and crash avoidance and mitigation. In addition to top-of-the-line safety, the Mini Cooper also has world-famous handling, premium technological options, and a variety of trim levels to meet every need. 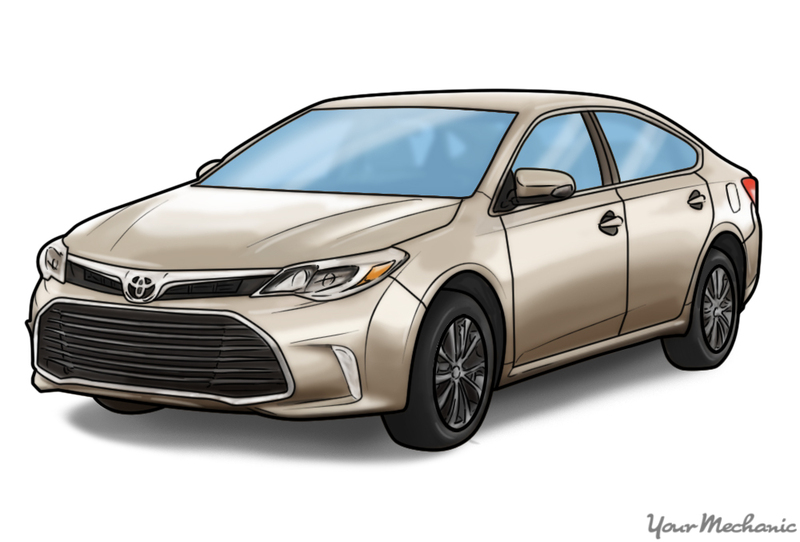 Toyota Avalon: The Toyota Avalon has a "Superior" rating when it comes to front crash prevention. It also excels in other areas with a "Good" rating in crashworthiness testing, according to the IIHS. Coming in a variety of trim models, including a hybrid, the Toyota Avalon features LED headlights and tail lights, dual exhaust, and a 268-hp V6 engine. The fully independent suspension gives the Avalon a smoother ride and the ability to adapt smoothly to road conditions. 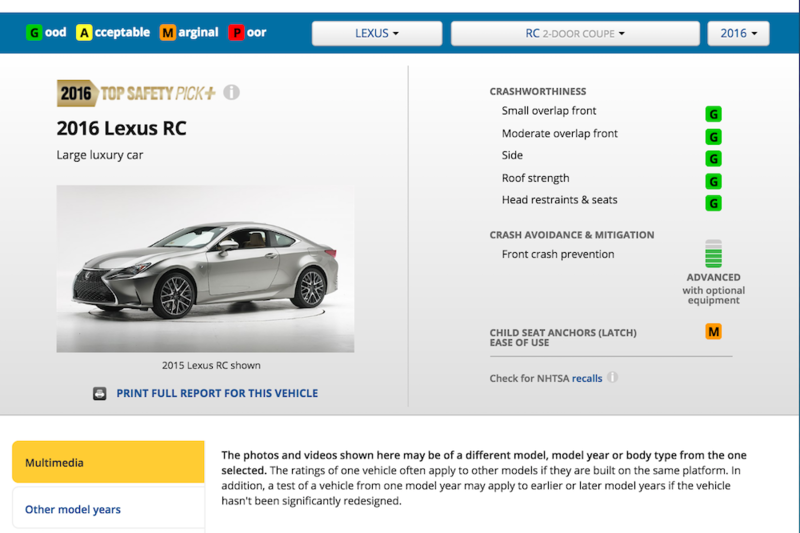 Lexus RC: The Lexus RC gets a favorable rating of "Good" across the board for its crashworthiness testing, while its front crash prevention gets a rating of "Advanced". Coming in both standard and sport trim, the Lexus RC and RC F Sport feature a stylish exterior and luxurious interior, and the vehicle comes in both rear-wheel and all-wheel-drive versions. 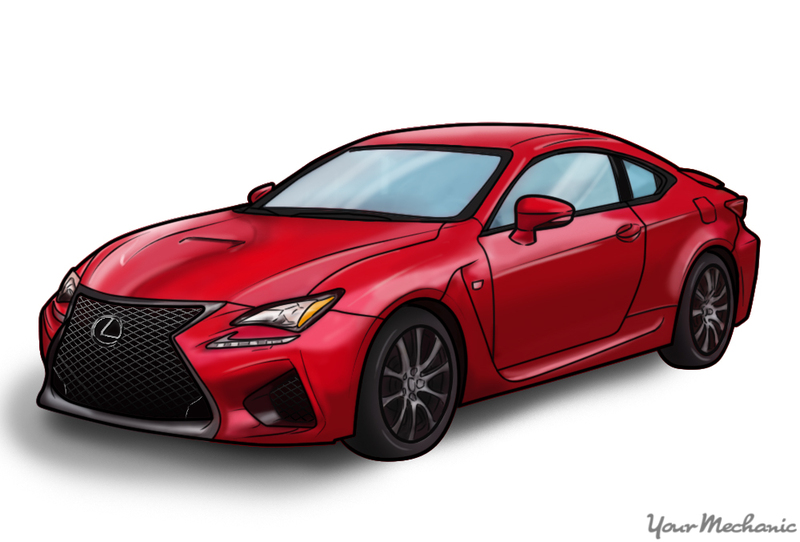 A sportier Lexus, the RC focuses on performance over grand touring. With the rise and fall of gas prices, filling up your vehicle can sometimes be a costly affair. That is why you probably want a vehicle with good fuel economy. This allows you to save money at the pump, which you can then spend on things you need. While most of the vehicles listed have a short driving range, the amount that they save you at the pump is considerable over the lifetime of the vehicle, making them perfect for short trips to the store or round-trip commutes of 80 miles or less. 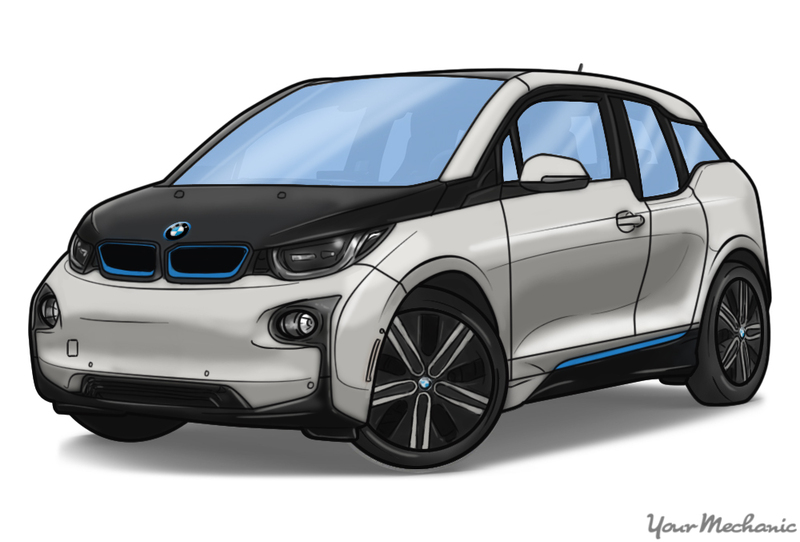 BMW i3: A plug-in electric vehicle (EV), the BMW i3 features a 170-hp engine, which gets an amazing 137 MPG city and 111 MPG highway. The i3 also has a 1-speed automatic transmission and can seat four. The vehicle comes with an on-board navigation system, automatic temperature control, and an auto-dimming rearview mirror. 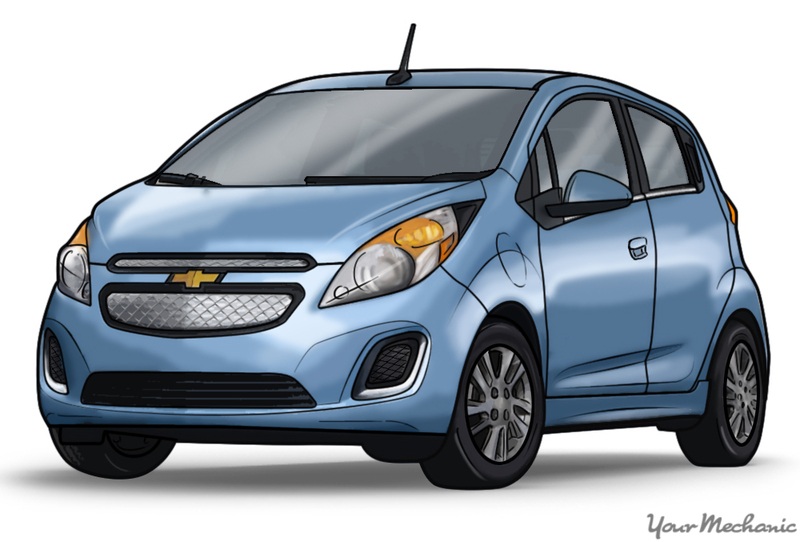 Chevrolet Spark EV: The Spark EV, produced by Chevrolet, gets 128 MPG in the city or 109 MPG on the highway. Featuring a 134-hp 1-speed automatic engine, the Spark EV comes with heated front bucket seats, a low tire pressure warning system, and automatic temperature control. Like many EVs, the Spark is perfect for those needing transportation for shorter trips, such as a short commute to work. 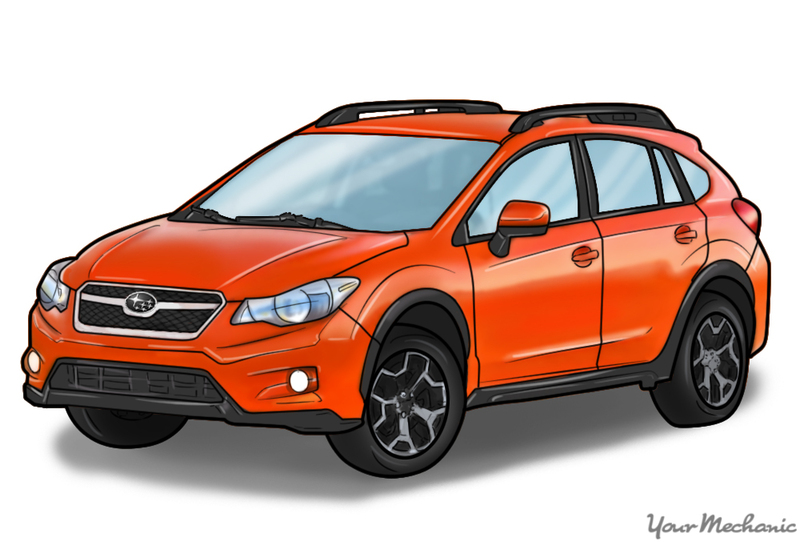 Subaru XV CrossTrek: The more standard Subaru XV CrossTrek features a gasoline engine. Unlike most early SUVs, the CrossTrek gets decent gas mileage, including 23 MPG city and 31 MPG highway. Some standard features include Bluetooth capability, a trip computer, and Eyesight Driver Assist technology, which alerts you to dangerous conditions and can apply the brake if needed. Whether you have kids or it is just you determines in large part the number of passengers you need to haul. Vehicle size can vary, from a small compact car, such as the Kia Soul, to a large, multi-seat vehicle, such as the Chevrolet Suburban. Vehicle size is not only dependent on the number of people you have to seat, you might just like the feeling of sitting higher up that larger SUVs and trucks provide. 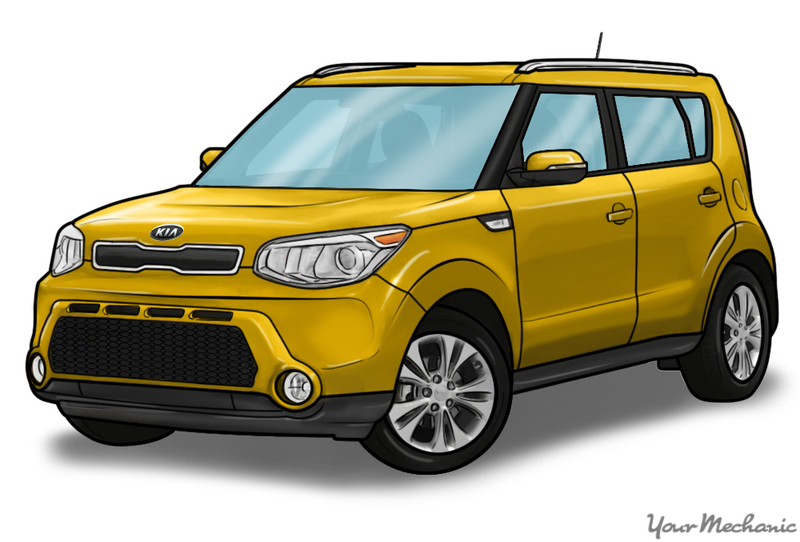 Kia Soul: Considered a crossover SUV, the Kia Soul comes with a variety of optional features and trims. The vehicle has also won a variety of awards, including those for best deal and its great safety ratings. Its low starting price, high fuel mileage, and sleek and sophisticated styling make the Kia Soul a great car for an individual or student on the go. The latest Kia Soul's ability to seat up to five makes it a perfect car for a student on the go, allowing them to more easily find parking when going to class or to fit all of their friends in one car for a fun-filled night on the town. Honda Accord: Combining a blend of the best in ride, handling, and packaging, the mid-size Honda Accord has a comfortable rear seat, allowing you to transport you friends, family, and coworkers in style and comfort. The vehicle's powerful engine, combined with its high gas mileage, and the ability to seat five make the Honda Accord a great deal for new couples or larger families. 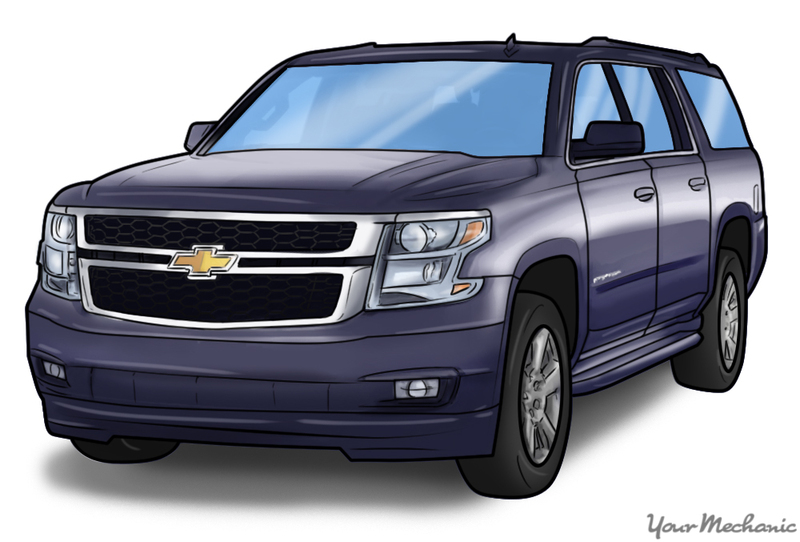 Chevrolet Suburban: A full-size, extended-length SUV, the Chevrolet Suburban offers the maximum in passenger seating, including the ability to seat anywhere from seven to nine passengers depending on trim level, making it the perfect vehicle for transporting an extended family or for a sports coach trying to get players to a game. Plus, if you need to haul items for a quick weekend getaway, the configurable nature of the vehicle allows you to transport items easily and safely. The ability to haul items appeals to many. Versatile cargo haulers help whether you are working on a project at home or need it for your job. Some vehicle owners keep a truck or other cargo hauler in addition to their regular car just for this purpose. 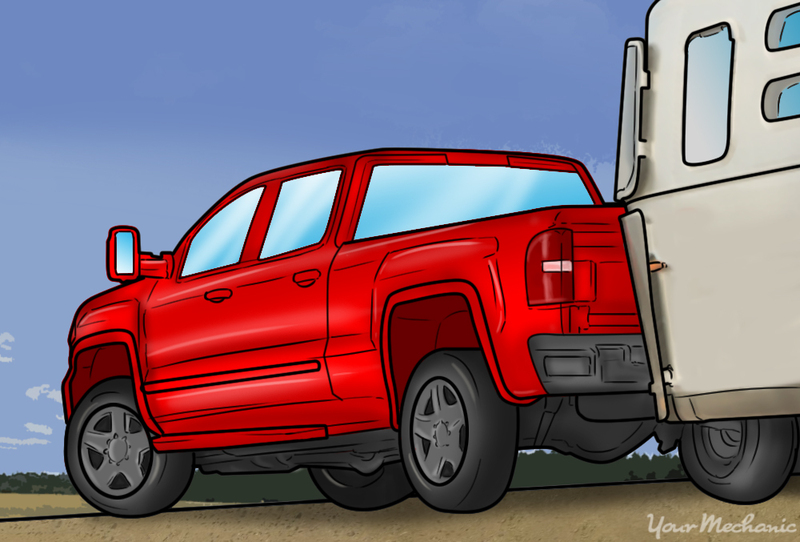 The options when choosing a vehicle to haul items and material with are plenty. In addition, you can use a vehicle to tow a trailer, camper, or other items. Another option, common with vans, is the roof rack. The roof rack gives you even more space for hauling luggage and other materials. Toyota Sienna XLE: A minivan, the Toyota Sienna XLE offers plenty of cargo hauling capability at 70.5 cubic feet of cargo space. What makes this capability even better is its relatively good fuel economy for a minivan of 20 MPG. 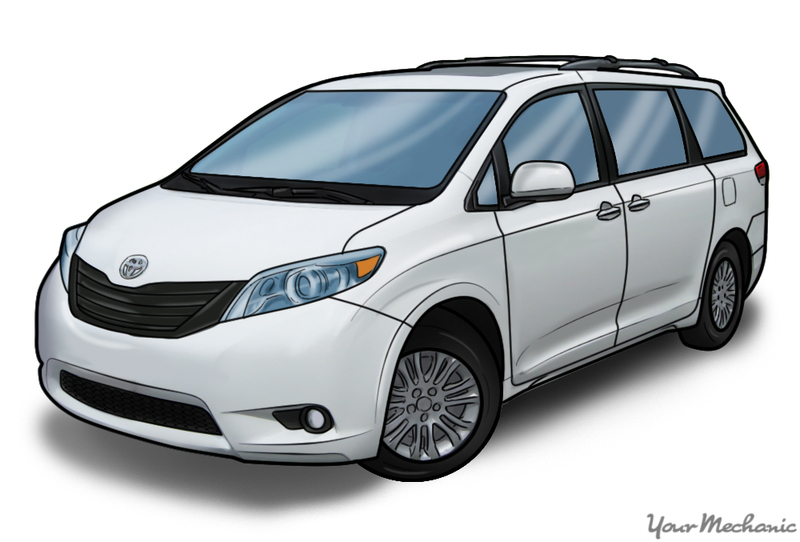 Coming in both front-wheel and all-wheel drive versions, the Sienna XLE works great when transporting the family around as well. And while its towing capability is not as great as a heavy-duty truck, the Sienna XLE can still tow a trailer and cargo weighing up to 3,500 pounds. In addition to its interior cargo space, the Toyota Sienna XLE has a roof rack, allowing you to place luggage and other items on it for easy transport when going on family trips and vacations. The best and safest way to haul cargo on the Sienna's roof rack is to use a cargo box or bag specifically made for this purpose. 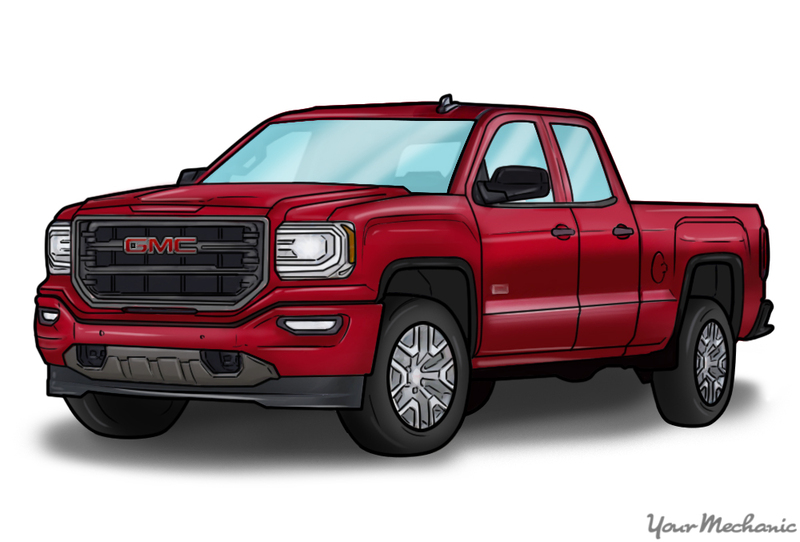 GMC Sierra: The GMC Sierra is a 4WD crew cab light-duty truck with a selection of cargo bed options, including short, standard, and long. You can also keep any cargo you have secure by using a truck bed cover in conjunction with the remote locking tailgate. Additionally, the cargo area has eight total tie-down hooks and LED box lighting for use when a truck bed cover is installed. When it comes to towing, the GMC Sierra has a variety of technologies designed to help you tow the items you need to. Some of these technologies include Hill Start Assist that holds the brakes when climbing a hill to allow you to switch from brake to accelerator more easily; an integrated Trailer brake controller that gives you unprecedented control of your trailer brakes; and Trailer Sway Control which helps keep any trailer hooked up stable while driving. 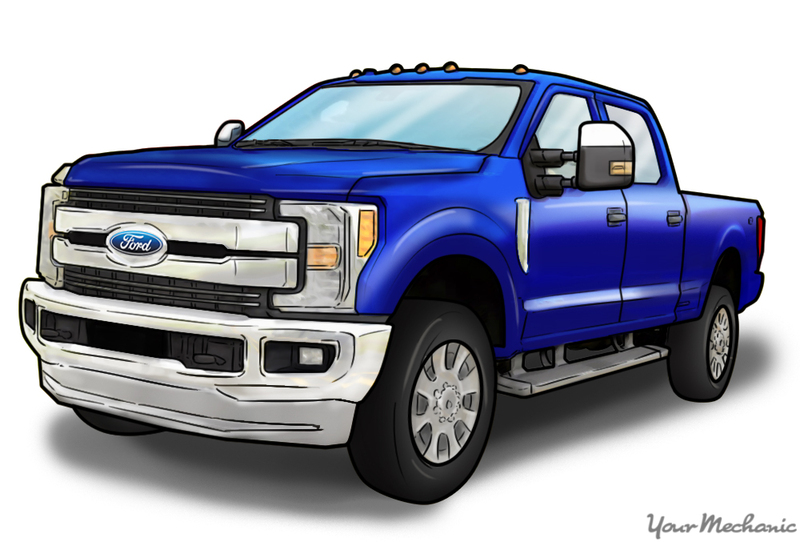 Ford F-Series Super Duty: With a powerful V8 diesel engine, the Ford F-Series Super Duty is designed for hauling a variety of materials, including building materials for the job-site or for a project at home. 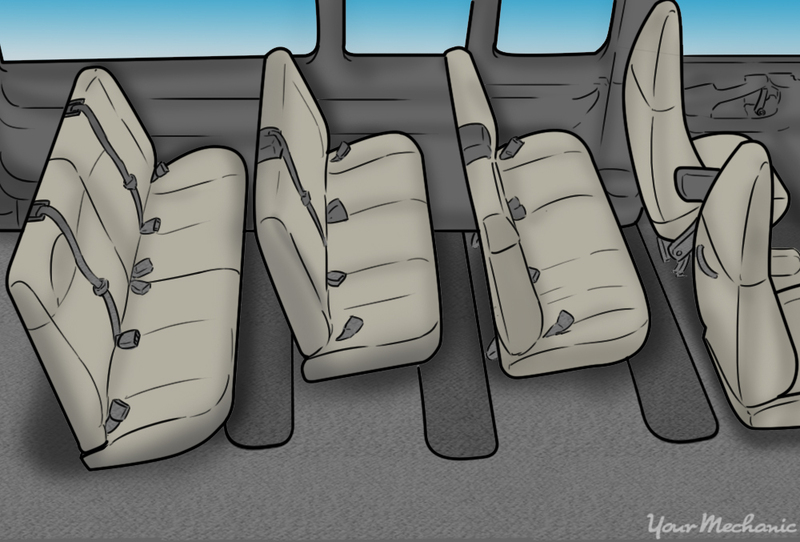 In addition, the crew cab configuration means you can transport your coworkers or the family when the work day is done. The Ford F-Series Super Duty also comes with Tow/Haul Mode and Engine-Exhaust Braking, giving you optimum control when hauling a trailer. Tow/Haul Mode changes the truck's transmission shift patterns, reducing the shift cycles to give your vehicle more power when hauling a heavy load. The Ford F-Series Super Duty also uses Engine-Exhaust Braking to help when braking while carrying a heavy load by using the engine exhaust to create backpressure in the cylinders and slowing the vehicle down. On-road and off-road capabilities represent another important consideration when picking a vehicle to fit your lifestyle. Depending on where you live, the ability to traverse a variety of terrains offers certain advantages. Those who live in the city might find that a vehicle with on-road capabilities is all they need, though journeys into areas they are not familiar with, such as a cross-country trip, might require an off-road vehicle. Living in the country is a little bit different, especially if you like to hit the dirt trails from time to time. Bad weather can also slow you down unless you have a vehicle with off-road capabilities to get through mud puddles and other road hazards. In addition, construction workers often find traveling in a vehicle capable of going off-road is a job requirement, especially with construction sites that are hard to traverse. Construction is not the only career field where you might find the need for a vehicle with off-road capabilities. Others include utility workers, park service workers, and any number of careers that require you to travel to the fringes of society. Jeep Wrangler Unlimited Rubicon: The Jeep Wrangler Unlimited Rubicon provides the ultimate in off-road driving. Able to tackle the roughest of trail obstacles, the Rubicon is durable inside and out. The vehicle also uses a variety of systems, including Hill Descent Control to make descending event the steepest of inclines a piece of cake. 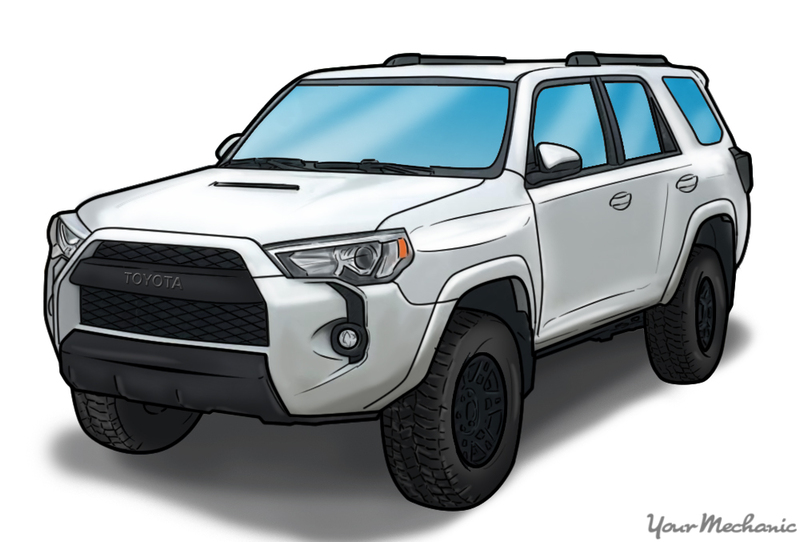 Toyota 4Runner TRD Pro: Using a flexy coil-link rear suspension, the Toyota 4Runner TRD Pro gives you the best in control when in a variety of off-road driving situations. The 4Runner TRD Pro is outfitted with stylish 17-inch matte-black TRD alloy wheels that are specially fit to the TRD Pro according to weight, offset, and brake clearance, giving you optimum performance off-road, but the best in style while driving on city streets. Ford Raptor: With a 411-hp V-8 engine, the Ford Raptor gives you both speed and power while driving off-road. 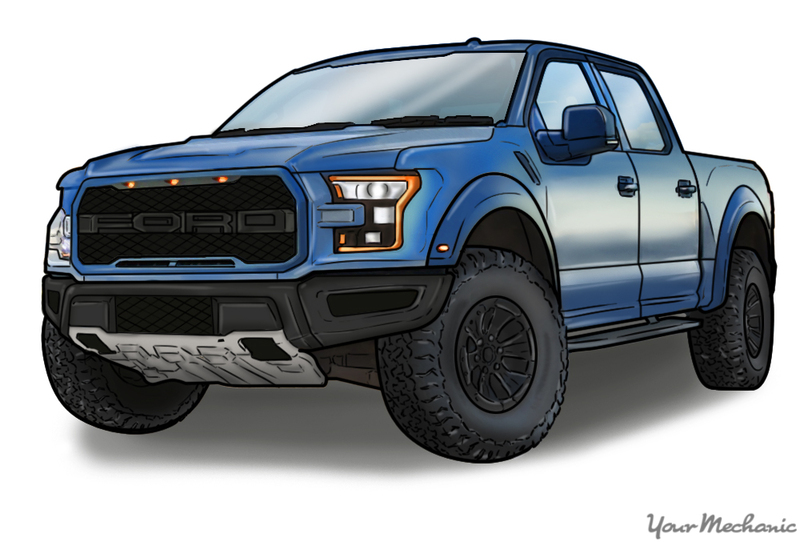 Add to that its suspension, wide track, and 35-inch tires, and the Ford Raptor can handle a large variety of off-road terrain. It's over one foot of wheel travel means that the tires remain in contact with the underlying surface, keeping your ride as smooth and level as possible. Regardless of your lifestyle, finding the right vehicle for your needs is important. If your search leads you to consider a used vehicle, make sure to have one of our expert mechanics perform a pre-purchase car inspection. Q: Is a 2001 GMC Yukon SLT with 222000 miles worth buying?